With falling water temperatures, a new moon weekend and fish stockings galore, there’s lots of options for a fall-time fishing adventure. We stocked scenic Oak Creek with rainbow trout this week, where water temperatures at stocking locations were a cooler, trout-loving 52 degrees. Lynx Lake got lots of trout, too, and water temperatures this week were at 50 degrees. A couple anglers also reported some good action on brown trout at Ashurst Lake, southeast of Flagstaff. One of the top options will be striped bass fishing at Pleasant, Mead, Mohave or along the lower Colorado River. Using submersible lights at night will be effective at attracting the plankton-baitfish-predatory fish chain. 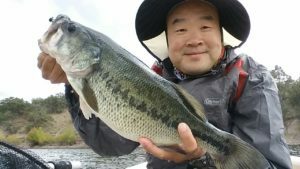 Roosevelt Lake has been on fire for largemouth bass fishing. Our biologists have been sinking tons of fish habitat structures, which attract fish and help anglers target these sport fish. Flathead catfish also can be great at Rosy, and with falling water temperatures, crappie fishing could be bust wide open early next week if some stable weather comes through. Look for schools on your fish-finders: They’ll form the shape of a Christmas tree. A drop in barometric pressure with storms predicted throughout most of the state during the next couple days could cause a drop in angler catch rates and make a bit more fish difficult to find, but once the storms clear and the pressure rises anglers might experience more fishing success. Be sure to cover a lot of water to find fish. After a storm (be safe! ), try fishing areas where run-off enters a fishery and may have been knocking nutrients and critters like worms and bugs into the water. For other potential hot spots, see our Fall Fishing Forecast, and this week’s stockings below. Rainbow trout: Oak Creek (52), Frances Short Pond (55), Lynx Lake (50). Channel catfish: “Expansion” Community fishing waters. Rod sent a report of catching a number of nice largemouth bass like this off an underwater ledge using a small jig. He said the weather was windy (more than 15 mph) and cold (upper 50s) in more than 15 feet of water. Family Fishing Fun. 7 a.m.-11a.m (Time Change), Encanto Park (NW side of the lake) 2605 N. 15th Ave. Phoenix. Please join the AZGFD Sport Fishing Education Program and City of Phoenix Parks and Recreation for a morning of family fishing fun! We will be providing loaner rods and bait for this event (or you may bring your own). Bring your family out to enjoy free fishing and instruction from AZGFD Sport Fishing Education Staff and volunteers. The event is open to all ages. The fishing event will occur at northwest end of the lake. Fishing licenses are not required, during the planned hours of the event, for those who register at the Game & Fish Booth. For more information please contact the Sport Fishing Education Program at (623) 236-7240. Previous story Angler Report: Silverbell catfish are biting!